Thanks for the photos of this Kmart turned Wal-Mart. I'm glad that you were able to take photos of the Wal-Mart before it relocated. Although the building is not in perfect condition and although there are some dated aspects to the store, the Wal-Mart looks much more modern inside than most Kmarts of a similar (or even somewhat newer) vintage. It looks like Wal-Mart did repaint the interior and redid the flooring in somewhat recent times. I wonder if this store had the large HVAC registers like many vintage Kmarts have/had. If so, I wonder if Wal-Mart removed them. The store also looks cleaner and better stocked than most Kmarts. Although the exteriors of the Memorial Parkway NW Kmart and the Wal-Mart look to be in similar condition, one can't help but to notice that the Wal-Mart seemingly had many more cars parked in front of it than the Kmart even though the Wal-Mart parking lot seems relatively barren compared to the scenes often seen at Wal-Mart Supercenters. There could be other factors at play that is causing that, but perhaps the cleaner/more organized interior of the Wal-Mart (or at least chainwide perceptions that Wal-Mart is better than Kmart in that regard) can explain some of the difference. Anyway, it's very interesting to see a Wal-Mart in what was obviously a billboard style facade ex-Kmart. 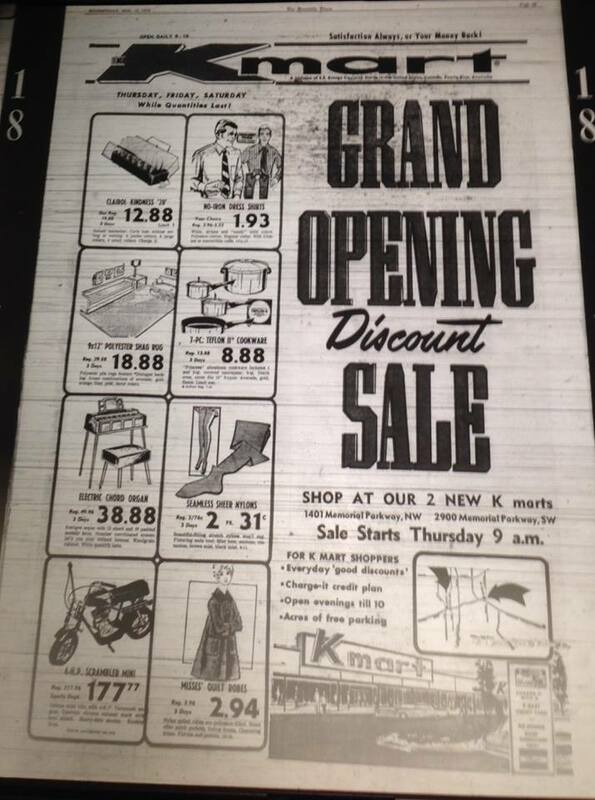 It's also interesting to see how much buzz there was when Kmart came to town in 1970, but now the community will be without Kmart unfortunately just like my community and many others. Wow, I haven't seen that Walmart interior in years! When did the Kmart here close and the Walmart open? For a town with only two Kmarts this is surely an interesting story. I guess good land is hard to find in Huntsville and Walmart made a deal to quickly get a store opened. Was this the first Walmart in the area? I grew up in Huntsville. There was a 1970's era Walmart across the street prior. That Kmart closed sometime in the mid 90's, and Walmart took over the space because it was larger. Elsewhere in Huntsville, Walmart replaced traditional stores with supercenters nearby, but being in central Huntsville there was no real estate available at the time to do so. 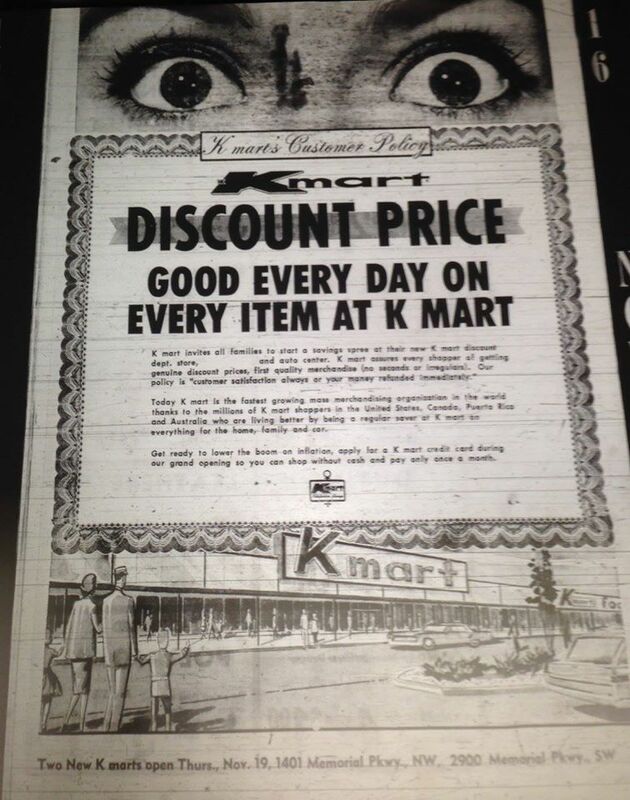 At one time, there were 4 Kmarts in Huntsville. There was one in far south Huntsville that opened in the early 90's, where an old 1970's Walmart was torn down at one end of a strip mall. That Kmart closed around the year 2000. There was another in suburb Madison, AL, which also closed around the year 2000. Where was the Kmart in South Huntsville? On the south end of what older residents still call Haysland/Hamilton. (There was a late-'50s strip mall named Haysland Square which had another named Hamilton Square added next to it in the late 1970s. Around 1990 they were combined as "South Huntsville Square" but that too-generic name never really caught on.) On the south end of Hamilton Square was a Big K. It was later replaced by a Wal-Mart and, after they moved to a Supercenter a bit farther south, that location became a K-Mart. When we moved to Huntsville in 1988, there was a 1970's era Walmart on the far south end of "Hamilton Square". I'm guessing it was an original anchor. My first 10-speed bicycle came from there. Walmart replaced that store with a newer store (this was before they started building supercenters) just to the south. In the late 90's, that Walmart was replaced with a super Walmart even further south off of Green Cove Rd. This one is still open. Last time I was there, the 1990 Walmart was a Hobby Lobby, but I think it's since closed. The old Walmart at Hamilton Square sat empty for a number of years. When the shopping center was remodeled in the early 90's, it became "South Huntsville Square", they demolished the old Walmart and Kmart opened a store. It was actually a really nice store. The south Huntsville Kmart closed around 2000 and sat empty for a while. About 5 years ago, Home Depot demolished the old Kmart space (as well as the Food World, a grocery store that also closed around 2000 IIRC). So today, Hamilton Square is Home Depot as well as the smaller stores that have always been there. My boss and family live in the Huntsville area and called it "Thr Stinky Walmart". When I was in town, I had to find out for myself and they were right. Reminded me of an old Walmart I went to in Oklahoma a few years back. I grew up in that part of Huntsville from the mid 70s through the 90s. There has been a lot of shuffling of big box retail in that area for years. Where Kroger is now was where the original Walmart was located. Kroger was originally at the west end of that building where Virginia College is now. Kmart closed and Walmart moved into that space. Then Kroger slid down to the old Walmart shortly after. That may have been Huntsville's original Walmart. I can't exactly remember. You can see the Pharmacy label scar on the left when this store was Kmart. Any chance the Kmart had an auto service area? If so, that could be what was in that area with the "dropdown" you see into what it looks like Walmart was using for outdoors stuff? Not that the opening is original, but they did often have a small counter area for taking appointments and checking out auto customers with a small door into the service area which could have been in that area and taken out creating the larger opening. The Wal-Mart at Drake and Memorial Parkway was the original Wal-Mart actually built by Wal-Mart. It is where Kroger is now. It moved into the K-Mart nearby after it closed and Kroger moved from their older store to the Wal-Mart space. Wal-Mart had a grand opening on August 11, 1981 for 3 stores at one time here, something they'd never done. They converted the two Big K stores (Haysland Sq. and Mastin Lake and the Pkwy.) they had gotten from buying out the chain and although the Drake store opened slightly before the other two in summer 1981, they had this "triple grand opening", a first for Wal-Mart in one city. 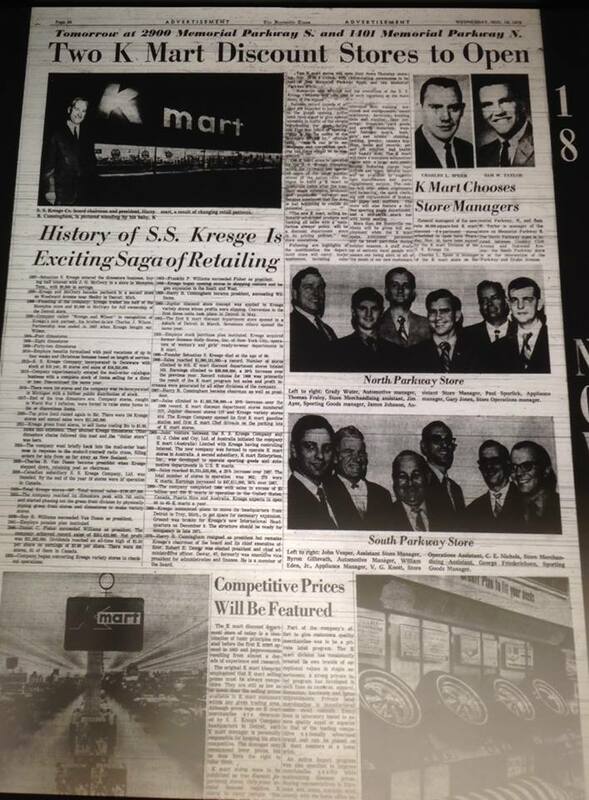 K-Mart opened both their original stores here November 19, 1970. It is unusual that both chains opened multiple stores at once here. The next Wal-Mart to open in Huntsville after the original 3 was the one On Jordan Ln. just north of University on October 13, 1981.